Unfortunately, people who suffer from chronic pain due to injury, disease or aging are also at a high risk of developing stomach ulcers – small holes or sores in the gastrointestinal tract. These people may be taking ibuprofen, naproxen or aspirin on a regular basis, which in turn can irritate and damage the lining of the stomach and intestinal tract. If one must take an over the counter pain reliever, acetaminophen may be a better choice, but new studies show that long term use of acetaminophen could damage the liver and kidneys. Acetaminophen is not an option for those patients taking aspirin to reduce the risk of heart attack. Acetaminophen is also not an option for people taking NSAIDs* to reduce inflammation from arthritis and other chronic diseases. Studies show that people who use NSAIDs are about three times as likely to have gastrointestinal bleeding. Even at low doses, NSAIDs can make mild ulcers much worse. Diet and Dietary Supplements: Let food be your medicine. People often underestimate the power of proper diet. In order to manage pain and inflammation with diet one needs to take a multistep approach. First – reduce pro inflammatory foods or foods that make your inflammation worse. In general foods that contain a high level of sugar and starch result in an increase in insulin. Spikes in insulin due to excessive sugar and starch intake results in an increase in inflammation. If you are serious about controlling your pain with diet you need to reduce your intake of sweets and starchy foods such as pasta, french fries, bread and chips to name a few. The best source of carbs is from fruits and vegetables. There are food guides available such as the glycemic index, glycemic load and insulin index that can help guide you toward making better food choices. http://en.wikipedia.org/wiki/Insulin_index. Second – the fat connection. Pain is a result of a series of chemical reactions in your body. In these chemical reactions your body needs certain substances to feed the pain cycle. Fats play an important role in this cycle. Unhealthy fats are typically the optimal nutrient source for the pain cycle. Eliminating certain fats from your diet and increasing your intake of healthy fats such as those found in fresh fish or fish oil based supplements can short circuit the pain cycle and provide relief. Certain foods and supplements provide a natural source of pain relief that may often be a safer alternative to some medications. These include Arnica officinalis, proteolitic enzymes and white willow bark (a natural form of aspirin) and curcumin to name a few. Our Chiropractic Physicians can recommend a diet consisting of whole foods and supplements specifically designed to help support your specific illness and cause of chronic pain. As always please consult your licensed healthcare provider for any drug interaction or potential side effects before you taking any herbs or supplements. Acupuncture: This ancient treatment has proven time and again to be an effective alternative to pain medication. Chiropractic Care: A great deal of chronic pain sufferers can attribute the cause to an illness or injury that may actually respond well to rehabilitation and chiropractic care as a long-term solution. Therapeutic Massage: Studies have shown that regular massage therapy may be just as effective as medication for pain relief. 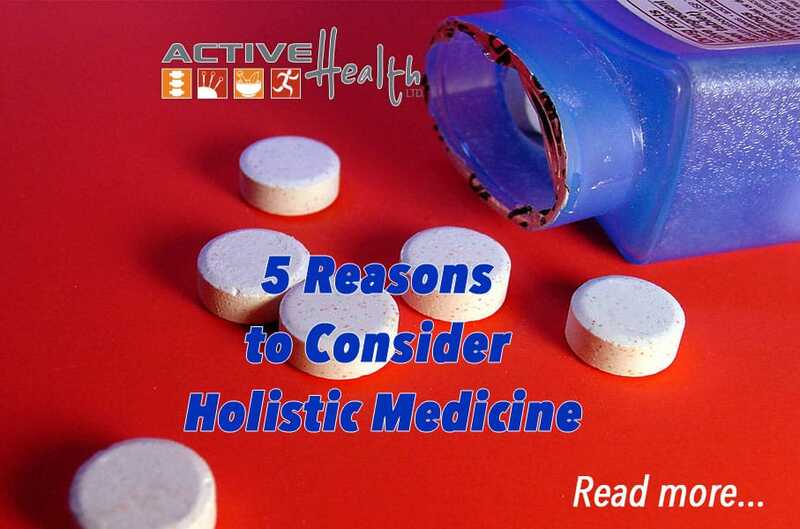 At Active Health Ltd we take a holistic and natural approach to healthcare. Our Chiropractic Physicians provide one on one care with individualized treatment plans to fit your lifestyle and needs.